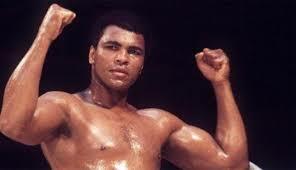 Hearing the words, “I am the greatest!” from a young black man as I watched a boxing match with my father was starting at the least for a young girl. But these words, that were spoken with confidence and defiance came from this young man who used the power of his athletic training as much as he used the power of his championship status and his commitment to advocacy. Muhammad Ali made some angry. In fact, he was the embodiment of a true dichotomy in which he was hated and loved by the same individual at the same time. Despite race, economics or gender, anyone who watched the elegant foot work and floating style in the ring was mesmerized. Muhammad had to be admired and despised, loved and hated, embraced and disowned because of his rise in the world of boxing, but also because he had the courage to speak out against racism and to take a stand against what he viewed as an unfair war. America was in a violent state, with the civil rights movement bringing injustice against blacks to the forefront. Rev. Dr. Martin Luther King, Jr. who was an arbiter for peace did not embrace Muhammad’s outspoken, in your face, intimidating words or defiant views, as a similar to the approach of the non-violent movement. But here is a note to all who feel it is open season on those of who made history in this country and had black skin. We don’t care!! We are not listening to you!! So what are we left to decide about Muhammad Ali when in the very minutes following his death, journalists, entertainment personalities and pitiful politicians began the process of trying tear his image down. Flimsy comparisons were being made between Muhammad Ali’s words towards white Americans was far more hateful than the Republican candidate (whose name will not be used in this writing) for President of the United States. But here is a note to all who feel it is open season on those of who made history in this country and had black skin. We don’t care!! We are not listening to you!! You do not have the power to diminish or affect the respect we have for our icons knowing fully that no one is perfect. Finally, I offer this suggestion to all who think we care??? Find someone who will listen because your words are falling on intelligent ears attached to a decisive brain, inside of a body who has lived the hell of racism and still faces the attempts to destroy our hopes, dreams and even our accomplishments. We remember and applaud the life that was Muhammad Ali. May his soul rest in eternal peace. You have left a legacy that will forever be unmatched.